Recently I visited the most beautiful public playground I’d ever seen. It was not the most extravagant, or the biggest, but it had love and care in every corner. The big trees had been protected so that they could shade the playing areas from the intense sun. The tables were shaped as maps of the Hawaiian islands, so that you couldn’t help but learn as you sat. The fences featured handmade carvings of turtles and whales and fish. Every corner of the property was being enjoyed, with people playing basketball and reading books and captaining a giant wooden ship. And near the entrance was a series of modest signs, each featuring a person who’d been instrumental in creation of the park. Unlike a lot of tributes, these signs did not cite dollars of donations or fancy titles. 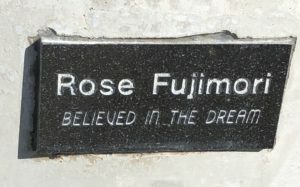 I don’t know if Rose Fujimori was a philanthropist, but I know she believed in the dream. I don’t know if Irma Chillingsworth was chair of the planning board, but I know she was a spunky go-getter. This has me thinking of all the components we need for progress. We need dollars, often, but what good are those dollars without a spunky go-getter? And we need that energy, yes, but that energy will flag at times if there’s not someone else who holds a steady belief in the dream. Dear friends, whatever we are working towards, what do we really need? Chances are that only a few of the most essential puzzle pieces are found in our budget spreadsheets and strategic plans. And if we’re lucky enough to hold more formal titles like manager or chair or donor, what else do we add? Could we be spunky go-getters? Believers in a dream? Every worthy endeavor needs an Irma and a Rose.